"For God so loved the world that He gave His only Son, so that whoever believes in Him might not perish but have eternal life" (John 3:16). God brings salvation through Jesus Christ, through His suffering and death on the cross. In ways that are mysterious, personal, particular to each one out us, He invites us to share His sufferings so that we might also share in His resurrection. Jesus unites us to Himself on the cross. Often there is consolation and a sense of strength in knowing this and calling it mind. 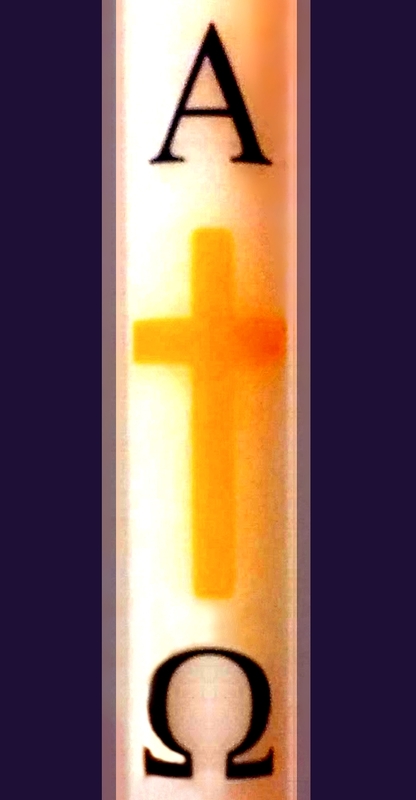 You look at the cross and it brings peace. Certainly you should do this as much as possible. But sometimes, in some circumstances, it's just very very hard. It's so hard, when you can't see Him. He's brought you so close to Him on the cross that you're seeing and feeling the wounds and you can't see His face. We believe that Christ is risen, and that our real life is in Him. There's a radical joy in the hope of eternal life. Suffering and death are not the final words on our existence. There's also sorrow and suffering because we're human, because we don't understand, and because faith and hope can be very obscure. But God knows our hearts, better than we know them ourselves. 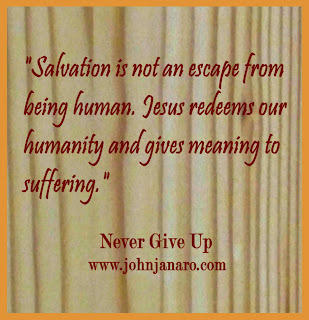 Salvation is not an escape from being human, from suffering and sorrow. 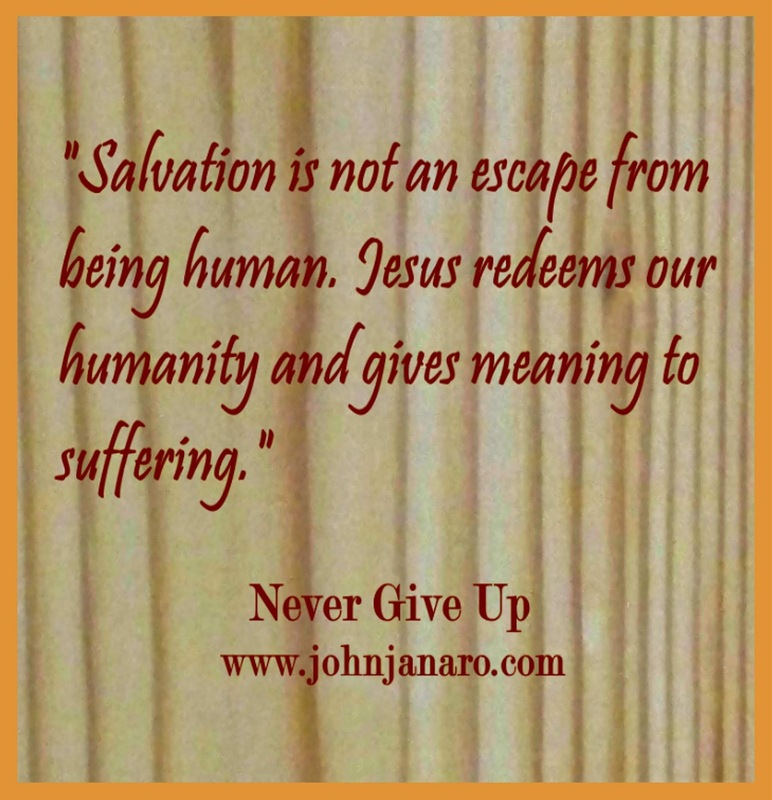 It redeems our humanity and gives meaning to suffering that is otherwise incomprehensible, that even seems cruel. God not only binds our wounds. He bears them in their open, bleeding, emptying-into-death and transfigures them in His risen body into the signs of the love that lives forever. That sounds mysterious and profound and good. But how does such a statement "connect" to the actual experience of the pain and dying of me and you from moment to moment? If we're looking for pablum, for a sentimental solution, or any solution we can measure, then these words will fail us. They will sound like abstract theology. God didn't give us pablum for our salvation. He didn't give us "solutions" for our salvation. He gave us His Son. Explanations fail us, people fail us, our own bodies and brains ultimately fail us. Jesus will never fail us. "Whoever believes..." Hold onto Him, and don't let go. Allow Him to hold you. Don't go away. Don't run from Him. Stay. Let Him hold you. "For God did not send his Son into the world to condemn the world, but that the world might be saved through Him" (John 3:17)... so that you might be saved through Him. Don't lose hope. He will hold on to you.